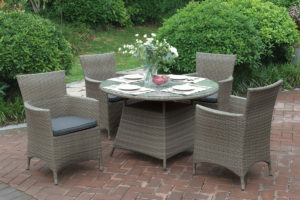 Make a statement with this 5-piece patio seat perfect for breakfast with family or dinner with someone special. It features furnishings draped in an aluminum and wicker resin frame. 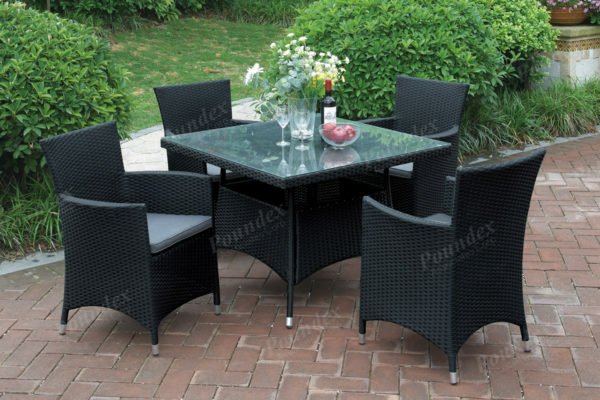 The set includes a square shaped table with a glass counter top and four chairs in a solid wrap design. All furnishings are rust-free with material that is also weather, fade, and heat resistant. Available in dark brown and tan. We absolutely love this new set! Hard to believe you get this for such a reasonable price. I cannot attest to the longevity of the product but it’s beautiful and the delivery service was reliable.